DERRY City could well be facing a pre-season mumps crisis, but so far the threatening outbreak only concerns the club’s Donegal natives! New striker, Cillian Morrison, has just recovered from the ailment, however midfield Sean Houston and reserve team goalkeeper, Sean Patton, are both understood to have been affected. Confirming the news at Friday’s pre-season Press session in the Brandywell, team boss, Peter Hutton, actually pointed to the benefits of the National Health Service. 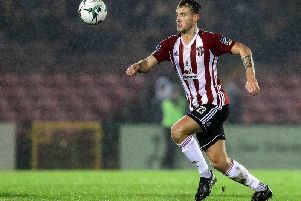 “Cillian has made a good recovery, but young Shaun Patton is struggling while Sean Houston has also been infected,” said the Derry boss. “So we’re keeping our fingers crossed that no-one else has it. To be honest, we won’t know at this stage as it can take a period of time before the symptoms come to the fore,” added Hutton. Given that Morrison, Houston and Patton all hail from the Co. Donegal area, could that be significant? Hutton answered: “It’s certainly interesting that it’s affecting our ‘southern’ lads as our Derry based players appear to be okay. “I’ve been told under the National Health Service, players north of the border receive injections as school kids to innoculate them from such diseases while across the border, it’s very much optional. “In other words, if you want to get inoculated against certain diseases at childhood, you must pay for the injections.